Jana van der Walt commenced with her musical tuition in Johannesburg at the age of six. Since relocating to the Western Cape some years ago, she has received numerous awards at various Eisteddfods and was awarded gold medals for three consecutive years at local Eisteddfods for the best piano player in different categories. She was a member of the Tygerberg Children’s choir with performances in Canada, Spain, France, Sweden and Denmark as well as a member of the ProCantu Youth Choir. Jana was awarded permanent placement on Unisa’s Roll of Honour for both harp and piano. She has received trophies for her harp playing and was awarded the UNISA (Hennie Joubert) award for harp. She has also attended International Master Classes on a number of occasions. Jana has completed her Grade 7 UNISA exams (concert harp) and Grade 8 Piano UNISA exams both with distinction and received a third position in the Western Cape for piano. While studying, Jana represented her residence with ‘cultural activities’, founded and coached an acapella singing group as well as coached serenading groups. She did arrangements, compositions and song-writing for these and was elected as adjudicator (three consecutive years) for the university’s serenade competitions. 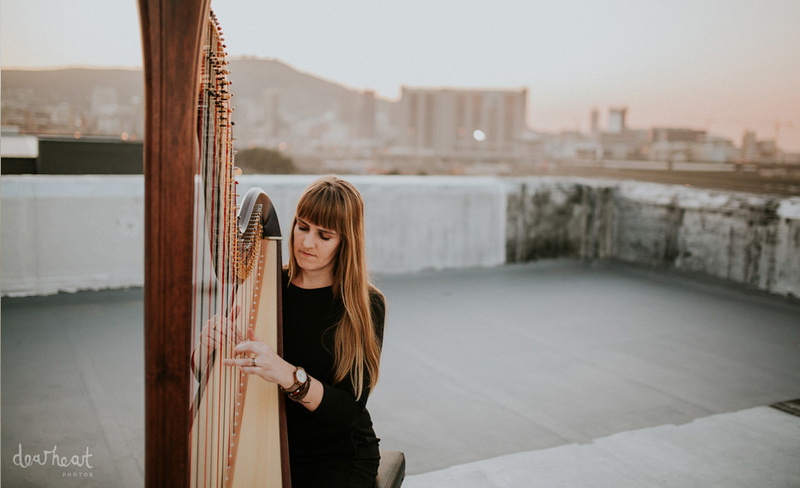 As an active orchestral harpist, Jana has performed with the South African National Youth Wind Orchestra, South African National Symphony Orchestra, Free State Symphony Orchestra, Stellenbosch University Symphony Orchestra, Stellenbosch Camarata and various other orchestras. Jana is also the principal harpist of the MIAGI Orchestra which will be representing South Africa in Europe in 2014. Jana is currently working as an architect and musician, performing regularly with orchestras and at weddings / functions. She loves to collaborate with different musicians and offers the option of additional musicians when performing at events (classical guitar / vocal / cello). She also teaches private lessons in harp. Available as a solo harpist or partnered on violin as a duo, Jana Van der Walt is a true architect with her instrument. The talented Van der Walt has received numerous praises for her performances, which over the years has seen her perform at some of the finest events around the world. Currently performing regularly at weddings and other events.